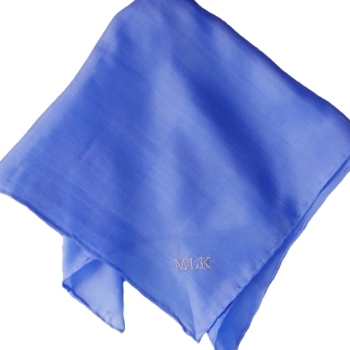 A pure silk handkerchief in medium blue to complete a gentlemans ensemble or present as a unique gift. A pure silk handkerchief in medium blue to complete a gentlemans ensemble or present as a unique gift. You can have this silk handkerchief monogrammed with initials or personalised with a name. A luxurious pure silk handkerchief with a hand rolled hem. A luxurious pure silk handkerchief with a hand rolled hem. Recomended for dry clean only and iron on low silk setting. We advise to iron using a plain cotton fabric over the silk to prevent scorching the delicate material. A fantastic gift for many occassions such as weddings, birthdays, dinner parties and any holiday! Amys Gifts bespoke embroidery is custom made to order and dispatched within approximately 2 days.